Hi hi hi! I'm back from Italy and thought today that I would give you some decorating inspiration by covering PLANTS because I saw lots of them in Bologna. 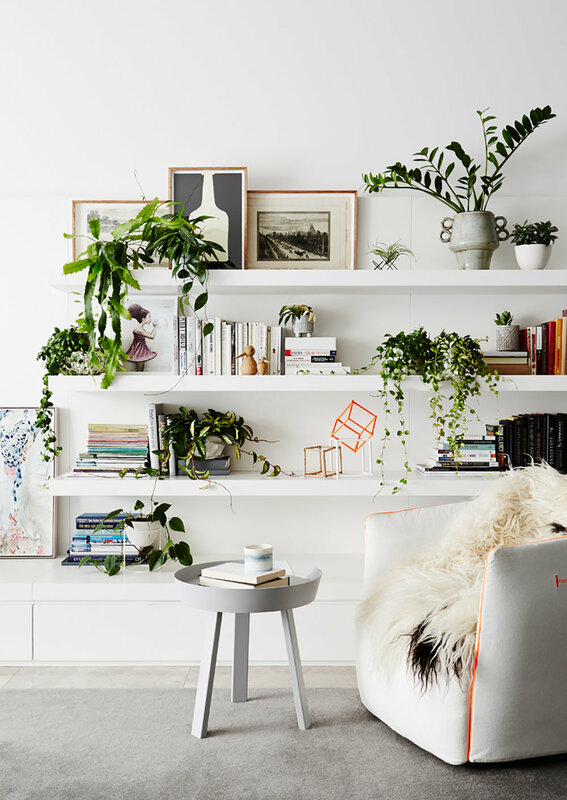 I recently came across a copy of the lovely new book, Plant Style: How to greenify your space by Alana Langan and Jacqui Vidal, the founders of Australian plant-wares label, IVY MUSE, with photography by Annette O'Brien and published by Thames & Hudson. I asked this creative duo if they'd be so kind as to give us 8 tips for decorating with plants since they are the plant and plant decor experts. Personally, I can't deal with a lot of anything at home - toys everywhere, clutter, pets, little things laying around, flowers or plants. To walk into a room that is busy busy busy makes me crazy crazy crazy. For me, a room is like a photo. Balance, negative space, focal point, light, well edited -- then I can feel good. If you are the same, then you will like Plant Style because it's showing plants in a fresh way that doesn't fit the 70s but works with modern living and what usually comes with that - no time, traveling, busy! When I cracked open my copy of Plant Style I felt like this book spoke to me, it's both beautiful and educational. It's also a small book, so it doesn't take up much space and you can bring it with you to the plant store to point out the plants you want to buy or custom order (I will do this!). It's a lovely book, I think you will really enjoy it too. Alana Langan (left) and Jacqui Vidal (right), IVY MUSE Co-Founders. The key to styling your living room with greenery is to get to grips with its special features, and then make the most use of them. Does it have period details like picture rails (perfect for hanging plants), a fireplace with a mantle (an ideal spot to create a green focal point) or does it have lots of open-plan space (endless options for plant styling)! Whatever your space may be, adding plants will increase the tranquility and feel of the room. Bathrooms are generally the simplest room in a house, and to be honest, they can be a bit boring. Even the smallest of plants can help soften bathrooms, breathing life and texture into them. 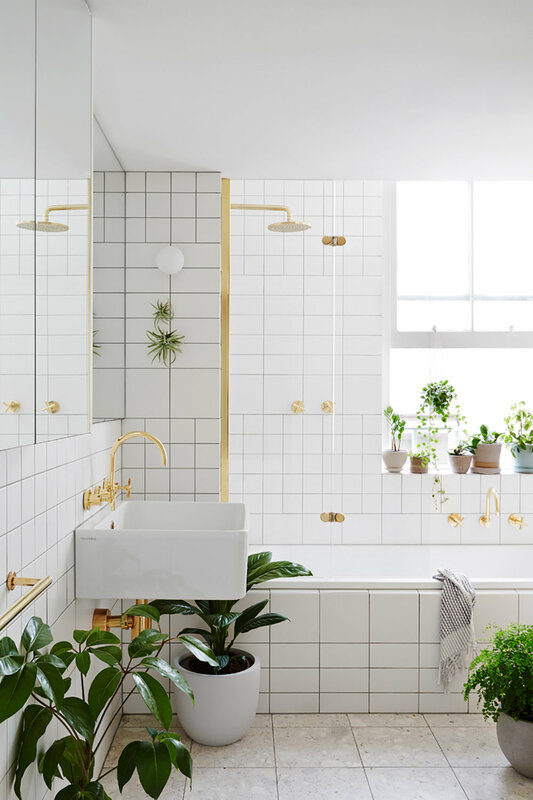 As bathrooms are often small, to really make the most of the space, take your greenery vertical; plant hangers, wall pots and even air plants attached to the wall are great options. Most plants enjoy bright conditions that are out of direct sunlight, and kitchens usually have at least one of these areas. There’s often space for plants to spread out - shelves, windowsills, benches, cabinetry or, at the very least, the top of the fridge. The key to keeping your plants thriving is to check them regularly. With so much time spent in and out of the kitchen, this becomes second nature. Sitting at eye level with plenty of room to play with, fireplace mantles are worth adding into your styling repertoire. Mix and match your plant choices to include different shapes, textures and tones. If your fireplace isn’t being used, try turning the hearth into an extra plant nook. To add extra interest, pepper shelves with personal trinkets in a variety of shapes and shades. It pays to keep things balanced too - if all the plants are on one side, it will look disjointed. Use a mix of upright and trailing plants to give your ‘green shelfie’ variation and texture. They may take a little practice to perfect, but ‘green shelfies’ are worth their weight in gold when you get them right. Focus on using spacing, texture and shape to best effect. Allow tendrils to float downwards to grab your attention, then create a visual journey with a variety of plants and pots. Bench seats provide flat space while remaining completely functional. Side tables and stools of varying heights create a staggered effect that gives each plant its own visual space. Free up space for plants on your bedside by using pendant lighting. READERS: BUY A COPY HERE (UK) OR HERE (GERMANY). Book will release in the USA in May 2018. Photography Annette O'Brien, Styling: Alana Langan.